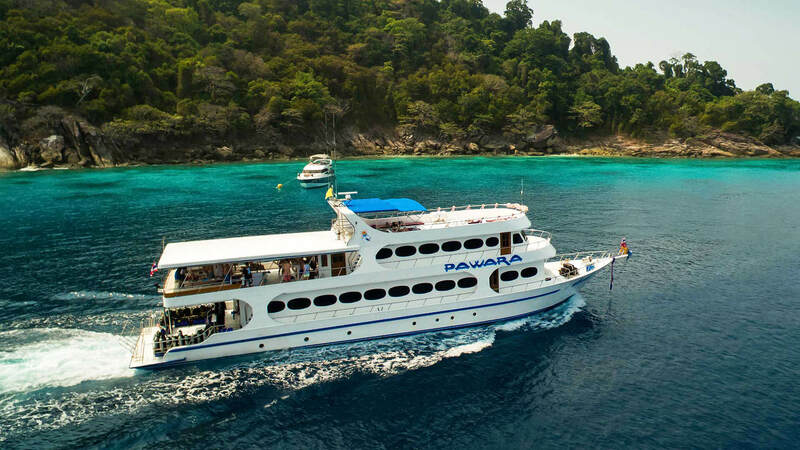 Enjoy the Similan Islands and Richelieu Rock aboard the liveaboard Pawara. She is a one of a kind, custom built diving vessel that combines the modern amenities of today's living and Thai craftsmanship. Pawara is extremely spacious. 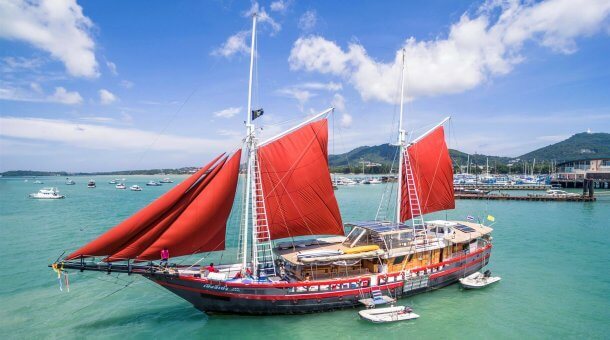 With her 35 meter long and 7 meter wide steel hull, she provides a stable platform from which to explore the Andaman Sea. Pawara is a Thai-Sanskrit word, which means ‘Treasures of the Corals’. Pawara has 13 cabins for a maximum of 26 Guests. There are 2 Master double or twin bed cabins on the main deck along with 4 Deluxe twin cabins. 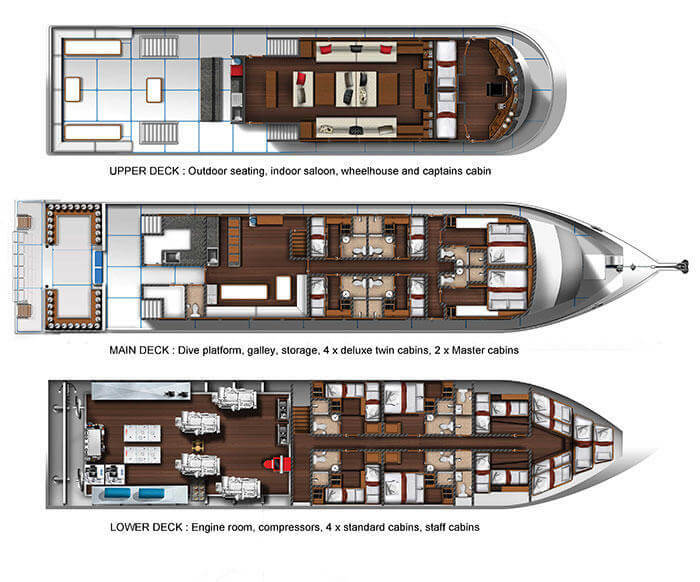 You will find 4 Standard cabins (which can be twin or double) and 3 budget cabins on the lower deck. Every cabin has air conditioning as well as en suite bathroom in all cabins except budget. The 35 square meter lounge is located on the Upper Deck. Here you can unwind from a days diving in a comfortable and air-conditioned room with a variety of indoor board games and TV/Video/DVD/CD/Karaoke facilities provided. The bridge, or the Captain’s control room, is well equipped with a full range of state-of-the-art navigation equipment. From here, the Captain will get an all around view, including views from monitoring cameras located in the engine room and the diving platform. 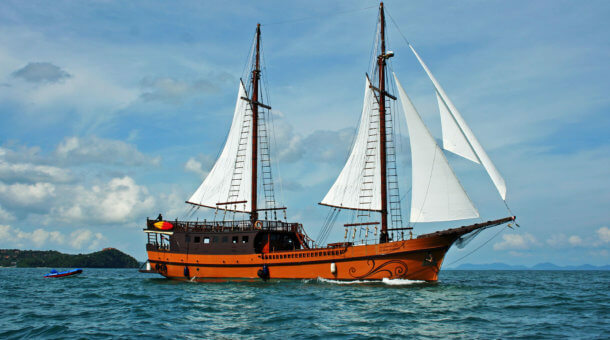 The Captain is a local who has had plenty of sailing experience and is an expert when it comes to venturing the Andaman Sea. Apart from the private shower & toilet facilities in your cabin, a common shower and toilet room is also provided by the large and organised dive equipment area for even more convenience. 3 meals are served per full day. Meals will vary each day and will comprise of Thai cuisines, fresh seafood, and international dishes. Our cook will ensure that you are well looked after for every meal on board. Food will be attentively prepared to suit your requirement. Snacks, tea and coffee are available throughout the day. Sodas and beers are for sale. There is free Wifi when the boat is in range of Thai mobile signal. There are 12 cabins – 2 Master at the front of the main deck (Master can be twin or double), 4 deluxe twin bunk cabins on the main deck and 4 standard twin or double cabins. All have aircon and bathroom/toilet. There are also 2 budget twin cabins on the lower deck which have aircon, but used shared bathrooms. 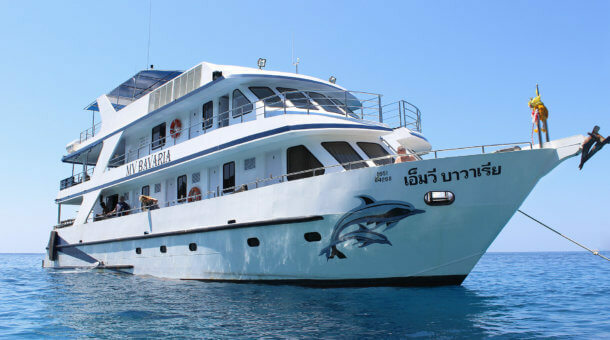 Rental equipment is provided by Sunrise Divers for our divers on the Pawara liveaboard. Rental price is 500 Baht per day for a set (BCD/regulator/fins/mask/wetsuit) and 250 Baht per day for a dive computer. We have a large equipment room at our dive center with 30 sets of Aqualung BCDs and regulators and a large selection of long and short wetsuits, open heel and full foot fins. 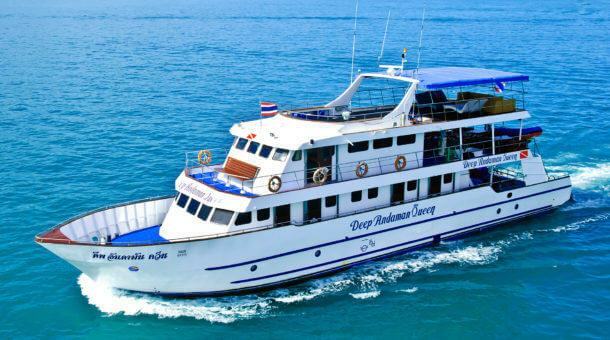 Pawara runs trips for 4 nights to the Similan Islands, Koh Bon, Koh Tachai and Richelieu Rock through the season from October to May.